Accessing land—and passing farms on to a new generation of farmers—are top challenges for New England farmers of all types. A $600,000, USDA grant to Land For Good, a regional and national leader in farmland access, will fund Phase 3 of a New England-wide Land Access Project that provides land access and transfer education, training and technical assistance to beginning and established farmers in collaboration with six state partners and over a dozen other organizations. The grant is part of $18 million recently awarded to 36 organizations nationally by USDA’s National Institute of Food and Agriculture (NIFA) Beginning Farmer and Rancher Development Program (BFRDP). Barriers to accessing farmland are a key source of increasing inequality in agriculture, especially because most new and beginning farmers come from non-farm backgrounds and are more diverse than previous generations of farmers. This grant follows two previous, three-year BFRDP grant awards for the Land Access Project (LAP), which also strengthened land access and transfer services. With the support of this grant, Land For Good stepped in at a crucial moment for Chase Hill Farm by helping the retiring farmers, Mark and Jeannette Fellows, with their transfer planning. Realizing the immediate need for identifying a successor, they connected with Ben and Laura Wells-Tolley who shared the Fellows’ passion and also received guidance from Land For Good. 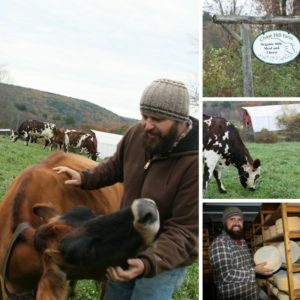 Chase Hill Farm (MA) is known for their tradition of organic farming methods and handmade cheeses. The farm will survive and flourish—strengthening the farmland security of the community—thanks to timely intervention and successful transfer of the farm and farm business. Phase 3 builds on this kind of progress and responds to the lessons, needs and gaps identified to keep land in farming by improving farmers’ secure access to land. This third phase of LAP will educate, train and advise over 2,500 farmers in New England. The project’s ambitious goals include providing individualized technical assistance to 150 beginning farmers, helping 200 farmers identify farm properties and connect with landowners, and guiding transitioning farmers through the farm transfer planning process. The grant will also help support the efforts of the New England Farm Link Collaborative, which coordinates state farm property posting websites and oversees NewEnglandFarmlandFinder.org. And the project will organize the first national Farm Link Clinic in April 2019. Activities have already launched with an upcoming training for farmers who want to plan for their farm’s transition. The Farm Succession School, taking place this winter, provides farmers and farm couples with structured and sustained support to make decisions, engage their families, and organize the legal and financial mechanics involved in a farm transfer plan. Topics include goal setting, estate planning, retirement planning, family communications, taxes, legal structures, bringing on a successor, and much more. The School will take place in NH and RI, but is open to farmers across New England. For more details, visit landforgood.org/events. LAP, phase 3, brings together six state partners including: Young Farmer Network (RI), New Entry Sustainable Farming Project (MA), Intervale Center (VT), University of Connecticut Cooperative Extension (CT), Vital Communities (NH) and Maine Farmland Trust; plus these collaborating organizations including the New CT Farmer Alliance, CT Land Access Working Group, RI Dept. of Environmental Management, Southside Community Land Trust (RI), Community Involved in Sustaining Agriculture (MA), Greenbelt – Essex County’s Land Trust (MA), Mount Grace Conservation Land Trust (MA), Vermont Farm To Plate, Vermont Land Trust, Southeast Land Trust (NH), University of NH Extension, Beginning Farmer Resource Network of Maine, and Maine Organic Farmers and Gardeners Association. The primary goal of NIFA’s BFRDP is to increase the number, success, and sustainability of beginning farmers and ranchers in the US. Learn more about BFRDP regular project grants and the educational enhancement team project grants.